Restaurant is a line of business that serve the public, so that transactions that came to be quite high. Especially for restaurants that have dozens of branches up to hundreds branches, it would be easier if it is managed with centralized restaurant information system for multi outlets business. In determining the information systems strategy to be applied, companies must have a plan for present condition and for the future. This can reduce the dependence or vendor locked-in which in some cases can hinder your operational agility. The restaurant business is in need of clarity and neatness business processes need to design robust systems. Restaurant business similar to the business of manufacturing or like a factory. The difference, multi outlet restaurant business will be more frequently meet with customers. The level of satisfaction and customer experience is a deciding factor the restaurant business continuity. And it can only be run on a solid digital ecosystem. Therefore, the information technology infrastructure must be improved and reviewed the restaurant from time to time. Here are some factors to be considered when choosing a restaurant information systems that can meet your business needs today and in the future. Restaurant business came from one business unit successfully won market confidence. Factors causing the success of such recipes, the restaurant’s atmosphere, layout and so on, it becomes a standard. Therefore, the owner of the restaurant business will feel the need to maintain these standards at any restaurant branch/outlet. From this starting point the restaurant business has had a market differentiate value to be maintained by each outlets. This module will provide ease of implementation and monitoring of standardization. By having a real-time monitoring of all operational restaurants performance, managers across the board have more basis in decision-making. Activities monitored may be different for each restaurants company. This monitoring tool should be able to measure more detail, such as speed of service, cleanliness of the restaurant, software quality and so on. This module also should be integrated with CCTV to facilitate physical monitoring. In the end, the company will gain efficiency in terms of monitoring. The entire historical data is stored and managed with best practices so it can help analyze and creating more accurate reporting. Accurate reporting will reflect the real conditions, an accurate analysis will provide ideas to improve business growth. Speed ​​and accuracy are important factors in meeting the standardization restaurant. A restaurant information system is quite complicated, and therefore as far as possible the routine tasks performed automatically. A digital ecosystem in the restaurant which has many branches should be simplified wherever possible. It is intended to keep operation agility and development speed can be maintained. In the era of digitalization, all vying to be able to improve systems both for internal needs and for customer satisfaction. IT infrastructure requires solid systems so it can enabling DevOps culture more quickly implemented in your company to get more ideas and innovation to support your restaurant business growth. Furthermore, companies need to determine the module or what features are needed in the information system of the restaurant. This restaurant management software module will contain information systems employee / HR, fixed assets, and so forth. This module can also be added to keep the menu management standardization. In sub employee management module, you should also have employee performance monitoring tool in realtime. Thus, the central and branch together can assess the level of service the restaurant. Starting from the purchase, including expiration date, up to stock transfer. The inventory management system must also support to pull data from outlets, so it can be used for a restaurant franchise system. This module is connected directly to inventory management module, cuisine menu management (included in the category of standardization restaurants) and financial reporting module. With the production module, calculating COGS would be more accurate. Will include an income statement and consolidated per branch, multi-currency support and taxation and has cash flow. All costs and revenues are grouped in each branch and the center. Cost and profit center becomes important especially at franchise restaurants. Financial reporting module also need to be equipped with accounts payable and receivable management. AR / AP management will include accounts payable and receivable aging and maturity scheduling. In the AR / AP module should be given a due date alarms. This module is also connected to the human resources (HR) information system for employee payroll system. An accounting information system, needs to have control on the post. In this case, most of the post will be done automatically, and partly done manually. Preferably, the entire transaction can be recorded automatically, so manual posting only for adjustment only. In the end, in addition to accurate, financial statements must be able to meet generally accepted accounting standards (SAK-ETAP / IFRS). Food ordering process can be done at the checkout counter. But it would further improve the service if reservations can be made from customers seat. This requires a Mobile Point of Sales systems, so all employees can receive orders. If the cashier has to maintain the orders, he/she would be too busy and can increase potential errors. In a good Restaurant Information System, customers should be able to know what they order and costs in order to avoid a booking error. The orders will be accepted also at the cashier and production management (kitchen). PoS feature can also provide a membership program that can be integrated on the module marketing through digital channels (digital marketing). A PoS will be equipped with the cash drawer and printer to print payment proof. In addition, there are also facilities for non-cash payments, such as debit cards, coupons and so on. Cashier staff will be closer to the administration. Their task include to keep payment transaction then submit it to finance department. PoS payment module will need to be connected with the financial modules. This is a module to meet compliance standards in the digital ecosystem. By defining different rights of access for: management, supervisors, and employees of the cashier, then you can have more powerful control. Furthermore, this module will be connected to audit trail in order to track activity/changes. Serves to track activity on PoS providing information, when and who is doing the activity. Audit trail required to meet the elements of compliance and accountability standards. The server will only be at the headquarters of the restaurant or on a colocation center. Equipped with backup and recovery system that is very important to keep your company’s data assets. Server managed to meet operational needs and development environment. Besides useful for data communication in real-time between the branch and the center, the network is also useful for communication between employees / management. The communication can be packaged in a collaborative management application, so it can be more focused and productive. PoS systems used should be as simple as possible, easy to use and stable. So the speed of onsite and online services can always be fulfilled by front staff. Behind PoS there is an ERP system that processes all operations up to the level of the restaurant reporting, monitoring and analysis. In this digital age, the restaurant business should be more pro-active and innovative. The involvement of employees and customers can provide very useful information for development. Companies can take advantage of these new tools to improve customer engagement by creating websites and applications for online orders. This will trigger the customer engagement through social networking. Thus, the company can determine the extent to which the level of customer satisfaction and what they expect from your business. 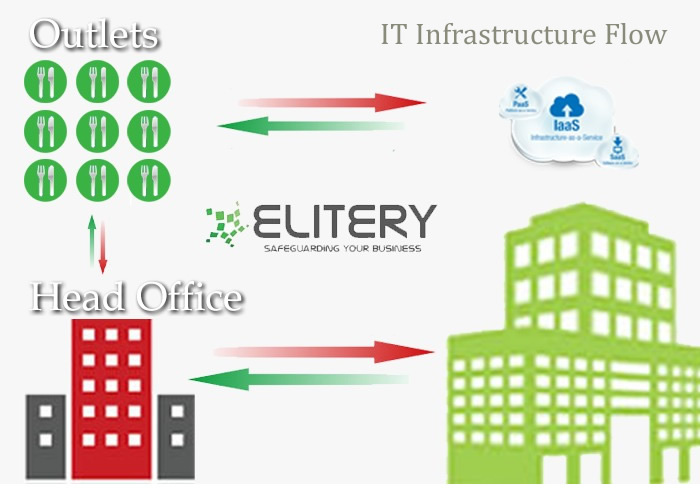 Elitery ready to help your restaurant business by providing a reliable IT infrastructure and solid IT operation that will support the success of the plan and also the purpose of your restaurant business. Feel free to contact us or call +62-21-750-2976 for any question or further information.